The Formula Series is DXRacer's answer to those seeking affordable luxury. These chairs are well-known to eSports players and their fans, featured by popular eSports teams such as compLexity, Dignitas, and Fnatic, and represented at big events such as UMG and WCG. The Formula Series’ high-density cold cure foam filling makes these chairs comfortable for extended use, even for sessions lasting 8 hours or more. With a tubular steel frame and a metal star base, as well as comfortable 8-position armrests, the Formula Series offers superb stability. With a tilt-mechanism angling all back the way down to 180 degrees, you're sure to be comfortable. 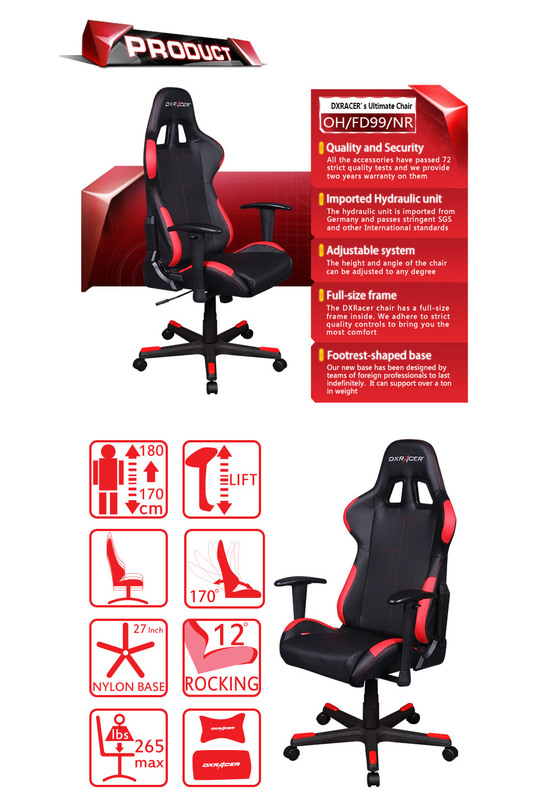 DXRacer chairs are manufactured under strict quality standards to offer the ultimate level of luxury and comfort. Although this chair was originally designed to heighten the gaming experience, it is sure to become your seat of choice for working and relaxing, too. No matter the activity for which you use your DXRacer, it will take your experience to the next level. Sit Better. Game Harder. Game Longer. DXRacer. Our new base has been designed by a team of specialized professionals to last indefinitely. It can support a ton in weight.